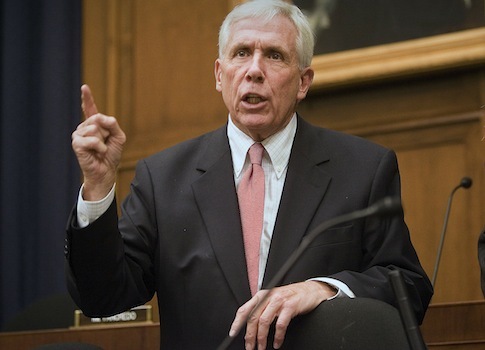 Rep. Frank Wolf (R., Va.) formally introduced legislation on Monday that would authorize the use of military force (AUMF) against the Islamic State of Iraq and Levant (ISIL or ISIS) and several other terror groups. The Washington Free Beacon first reported about the bill last week. In addition to ISIL, the bill would authorize the president to use military force against Boko Haram, al Shabaab, and Ansar al Sharia, among other notorious terror groups. Wolf's office said in a statement that "the motive behind the bill is to end any ambiguity about the president’s authority—or the Congress’ support—for a U.S.-led international coalition to disrupt and eliminate ISIS and al Qaeda-affiliated terrorist groups from committing genocide." Wolf's AUMF would be the first one approved by Congress "since the 2001 and 2002 resolutions authorizing military force against al Qaeda and the Taliban and against Saddam Hussein’s regime, and would fill in the gaps from past authorizations to deal with the current terrorist threat, including regional al Qaeda-affiliates who at times try to obfuscate the extent of their relationship with al Qaeda leadership," the statement said. This entry was posted in National Security and tagged Frank Wolf, Islamic State, Terrorism. Bookmark the permalink.